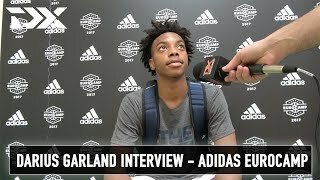 Outside of the Next Generation action, Darius Garland was sensational once again, scoring 13 points on just 8 shots. His skill level, quickness and creativity with the ball have stood out in a major way through the first two days of the EuroCamp as he's made a strong case for consideration as the top guard in the class of 2018, at least as far as future college production is concerned. He is extremely poised and confident for a 17-year old guard, especially one who is as small and slight as he is.